The second trailer for the upcoming Minions movie actually hit the web quite a while ago. I’ve just managed to stumble upon it because the website is a bit broken! The new trailer starts, almost, where the first trailer ended. 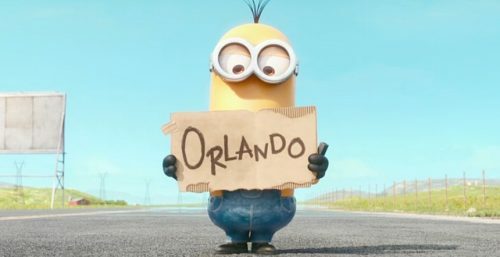 This new trailer introduces us to the Minions former [ or is it new? – ed] boss, Scarlett Overkill. What they get up to together, we’ve not been told but I’m sure it will involve an evil plan and trying to take over the world! This is what the minions needed. A kick start out of the depression that they are all in because of a lack of a master. It’s nice to see our favourite minions – Stuart, Kevin and Bob – still on their mission that they started in the first trailer. Where their new mistress will take them, that’s for the next trailer or sitting and watching the film when it finally gets into your local cinema. It’s 1968, and the Minions are headed to Villain-Con, the biggest gathering of evil anywhere. Here they meet Scarlett Overkill, first-ever female super villain.